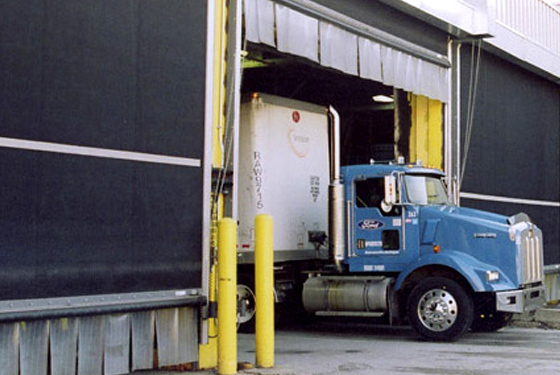 The RapidFlex™ series of high performance doors, by Overhead Door Company of Akron, are precisely engineered to allow for maximum productivity with high-cycle performance, fast-acting curtains, and resistance to damage from impact. 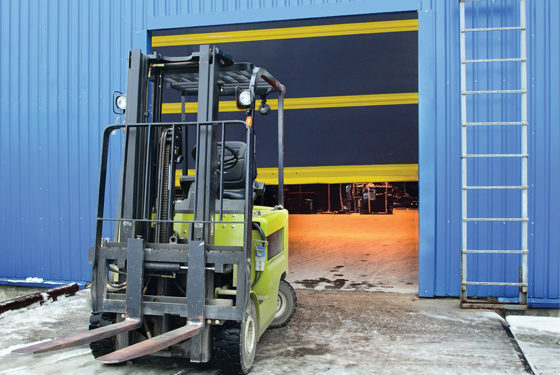 These rugged doors are designed with safety and efficiency in mind, and will keep your facility running effectively, securely, and environmentally controlled. 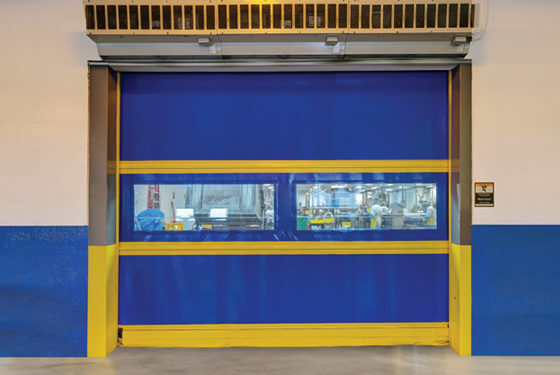 All of the RapidFlex High Speed fabric doors feature breakaway and self-reset, two sets of infrared obstruction detection, wireless reversing safety edges, and an industry-leading five year door system warranty. 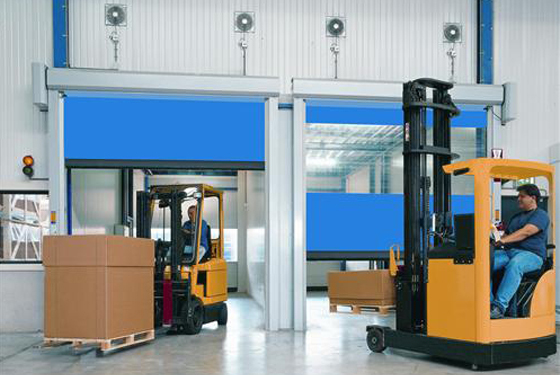 Our RapidFlex™ series of High Speed Fabric Doors provide the utmost in efficiency, reliability and return on investment, offering solutions for both interior and exterior applications. 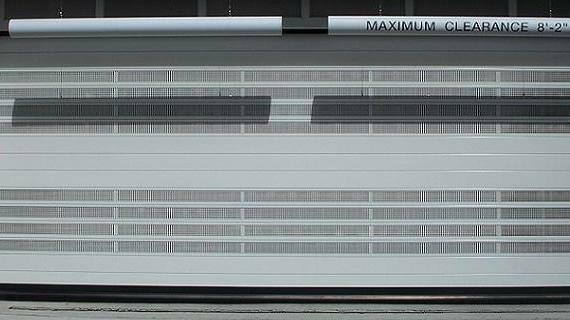 RapidFlex™ 990 Interior Model is a flexible bottom high speed fabric door. The flexible bottom is equipped with a wireless monitored reversing edge, in-plane infrared sensors, and a built-in drop stop device. This door was built for safety, and is ideal for high-traffic manufacturing, pharmaceutical, warehouse and distribution facilities. 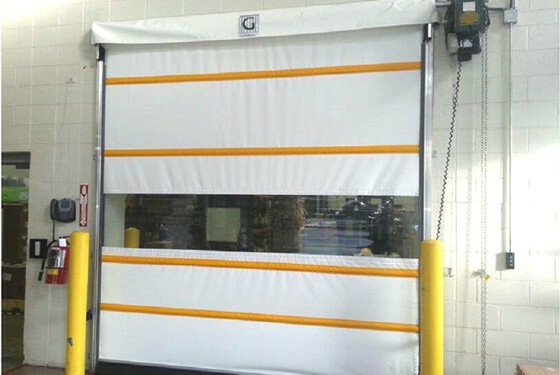 RapidFlex™ Interior Model 991 features dual recessed photo eyes, and a patent-pending curtain lock which allows the door to withstand pressure and enables it to be repaired quickly in the field. 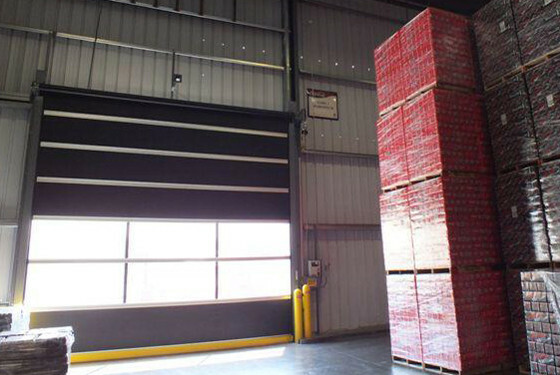 This strutless door is designed to reduce operational noise and is ideal for high-traffic areas and separating controlled environment spaces to prevent cross contamination, such as food and beverage cold storage facilities, manufacturing and distribution areas, and pharmaceutical facilities. 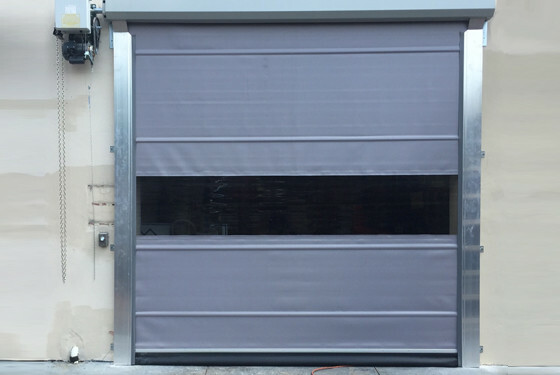 RapidFlex ™ Exterior Model 993 is a strutted, exterior high speed fabric door with a springless design for minimal interruption and maintenance, and a direct-mounted gear drive that minimizes wear and tear. This door has an independently tested static pressure resistance of 76 mph and dynamic ultimate pressure resistance of 53 mph. An industry-leader, boasting standard safety features that include reversing edge, two sets of infrared obstruction detection sensors and door stop device. 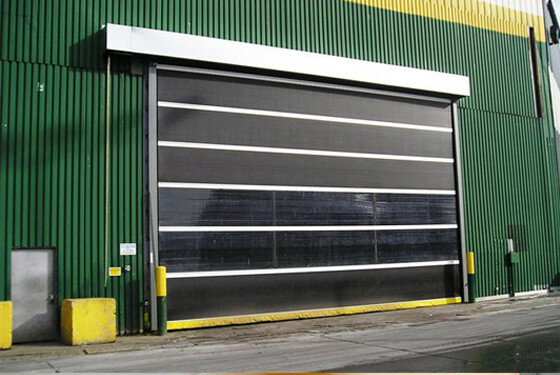 This door is engineered for high cycles, and ideal for use in parking garages, warehouse, manufacturing, and distribution facilities. RapidFlex™ Exterior Model 994 includes industry-leading standard safety elements, such as reversing edge, two sets of infrared obstruction detection sensors and door stop device. 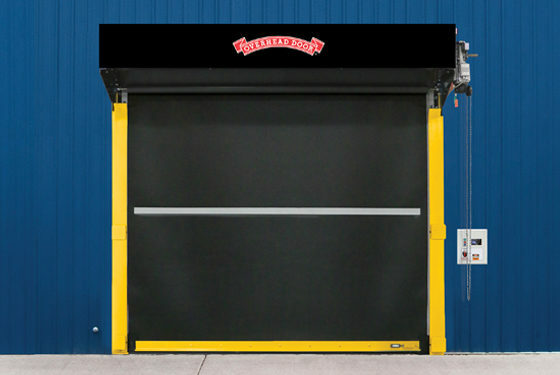 This door features an articulating wind strut, with patent-pending bottom wind lock and articulating roller wind struts, which reduces operational noise while allowing the door to withstand pressure. 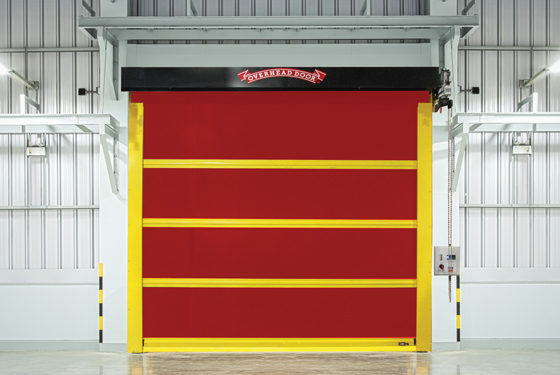 With an industry-leading pressure resistance, this door boasts an independently tested static pressure resistance of 158 mph and a dynamic ultimate pressure resistance of 75 mph. 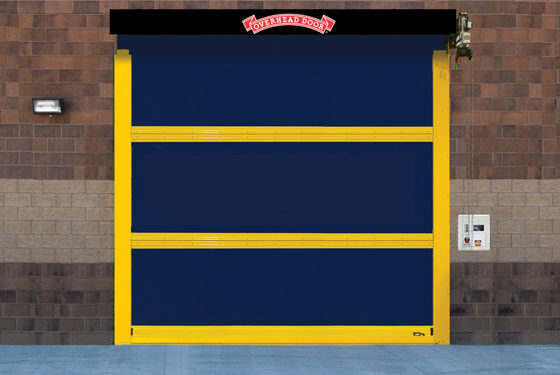 This door is the perfect solution for parking garages, auto/transit, mining, and manufacturing facilities. 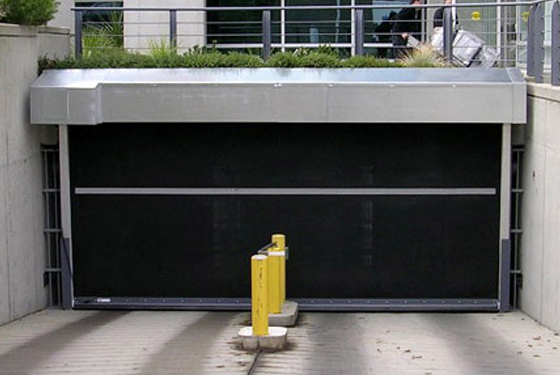 Our RapidFlex™ Exterior High Speed Rubber Doors are designed with an exceedingly rugged construction, providing strength and durability for extreme environments. 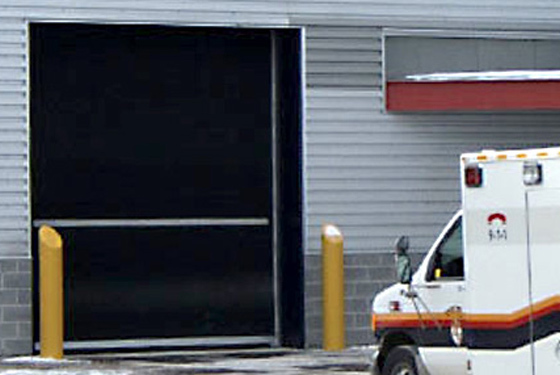 RapidFlex™ Exterior Model 995 is a heavy-duty exterior high speed rubber door that was designed for extremely harsh conditions. 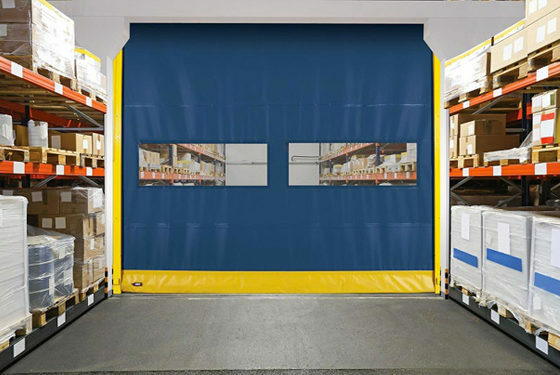 The rugged petrochemical resistant NBR rubber curtain is reinforced with polyester weave for added strength without the weight. This door features a patent-pending curtain lock design that was independently tested for pressure resistance and can withstand winds up to 180 mph and is operable in winds up to 75 mph. With industry-leading standard safety features, such as two sets of infrared obstruction detection sensors, reversing edge, and door stop device, this door is perfect for food/beverage facilities, mining operations, parking garages, auto/transit and manufacturing facilities. Examples of Applications: manufacturing, food processing, automotive, bus transit stations, parking garages, postal outlets, airports and railways. • Patented NEWGEN Guide and Curtain Lok System. After an impact the door is up and running in minutes. • Sleek profile, easy installation, reduced clearances & minimal maintenance. No hinges, cables, pulleys or tension springs. • Limited lifetime warranty on curtain and NEWGEN Guide System. • Door speeds of up to 55″ per second to open up to 30″ per second to close. • The slightly curved inside PVC slat profile moves very quietly and thus reduces noise even at high speeds. • No hinges, cables or pulleys or tension springs. • Suitable for interior or exterior applications. 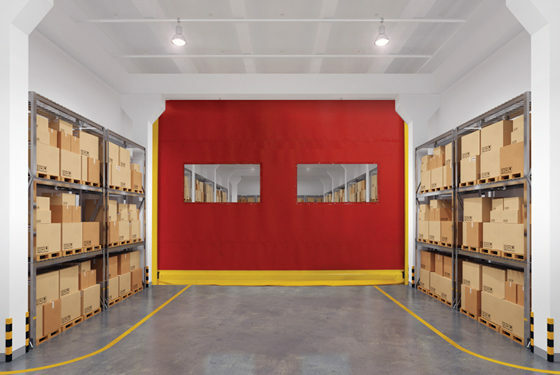 Our Vinyl High Speed doors help maintain a comfortable working environment in your facility by keeping hot or cold air in and can also aid in the control of dust and noise. 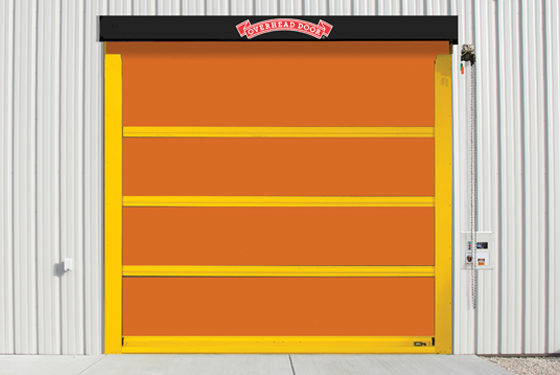 Vinyl doors can be readily installed on dock doors, and warehouse openings or be used as room dividers. Help conserve energy, deter intruders, with our economical alternative to other doors. Speed-Commander™ 1400 SEL — Standard on the Speed-Commander™ 1400 SEL is a light grid built into the guide tracks up to 8’0″ high. Completely free of coil cords, the light grid provides a thorough wall of protection for personnel and equipment at the doorway. A SoftEdge bottom profile with wireless breakaway switch simplifies installaton, reduces maintenance and minimizes risk of damage to the door. Exclusive Duratec® insulated windows are coated with a special finish which prevents marks and scratches caused by cleaning. The windows retain a clear view after many cleanings and with heavy duty use. The 4600 is constructed of interlocking aluminum hinges which act as integral windbars, creating a sectional panel design that provides panel stability and increased wind resistance. Low profile heavy duty steel guide tracks contain an 8’0″ high light grid as standard. 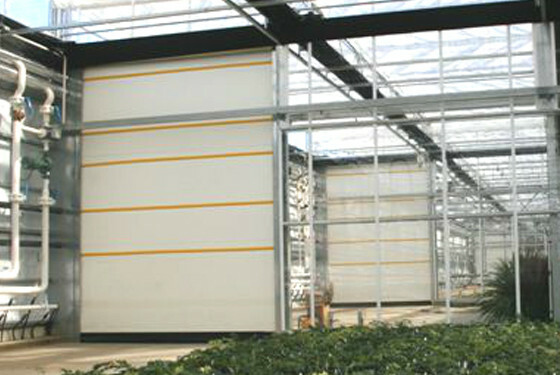 The light grid allows for automatic reversal of the panel and eliminates the use of a coil cord. It also eliminates the need for a panel reversing edge, which is typically vulnerable to damage, resulting in a reduction in maintenance and downtime. Full perimeter draft seals provide dust and odor containment as well as general environmental control.